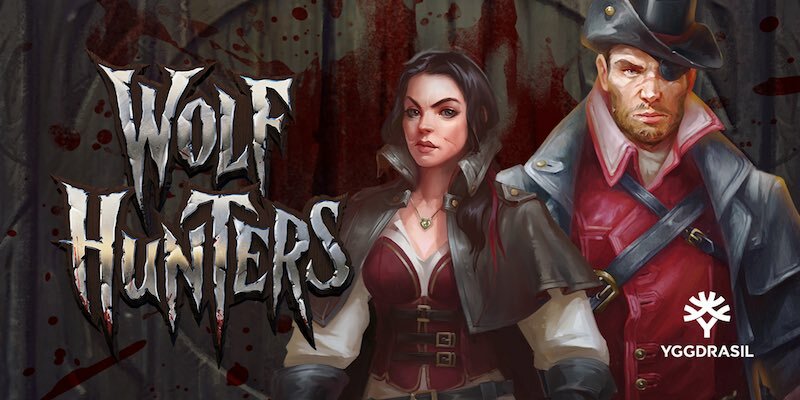 Yggdrasil Gaming has released another very cool new slot game today, Wolf Hunters. This slot game, with a werewolf theme and 20 lines comes with a ton of features. I will list all different features below and add a gameplay video at the bottom. When one or more wild symbols land on the reels, they become sticky wilds and award a free re-spin. As long as new wild symbols appear you are awarded new re-spins. A random hunter attacks each werewolf symbol that appears. When the hunter wins the werewolf becomes a wild symbol. This also reduces the health meter of the werewolf by 1 and adds 1 rage to that specific hunter. If you land the bonus symbol on reel 1 and 5 you are awarded with 10 free spins. Hunters have a higher chance of winnings fights against werewolves during free spins feature. During free spins you can power-up the hunters by collecting their power-up symbol three times. When the left hunter is powered-up you get 2 additional free spins and all wild symbols will expand to the left. When the right hunter is powered-up you get 2 additional free spins and all wild symbols will expand up and down. When you fill one of the hunters rage meters you will get 10 free spins with that hunter already powered-up, like mentioned above. When you have reduced the werewolf’s health to zero you will get 10 free spins where all werewolf symbols will become wild and will expand. As you can see, a lot of different bonuses and features. And a slot game that collects your progress. Don’t worry if you stop playing, the next time you start the game, your progress is still there. Play Wolf Hunters at all online casinos offering Yggdrasil Gaming slot games, like for instance Casumo.